We are meeting over lunch to discuss Dactyl Applications Inc., or ‘Dactyl’ as the co-founding team refers to it in shorthand. Dactyl was founded in June of this year with a mission to design and develop apps for the mobile and tablet markets. The company has achieved early success by focusing on the educational market. Their first product, ‘MultiFlow: Times Tables Reimagined’ was released in August and has already sold over five thousand copies and earned highly positive reviews, including a feature review on TUAW (The Unofficial Apple Weblog) an influential tech blog. The founding team includes Curtis, a Royal Roads University Bachelor of Commerce graduate, as well as his brother, lead coder Connor Duggan and lead designer Justin Barcelos. The company was started in a makeshift office in Justin Barcelos’ basement, but their brief stint there ended when they decided to relocate to the burgeoning Innov8 Hub, a newly created physical environment at VITP ideal for startups and small companies. The company plans to build on their initial success with more proprietary educational apps, while entertaining the possibility of creating a separate revenue stream by taking on contracts to build apps as a service to other businesses. Interested to learn more about Dactyl, their start-up journey, their product line up and where they are headed next I had a few questions prepared for Curtis. Q1: What were the driving forces in your decision to leave your stable 9-5 job and start your own tech company? I was actually very happy working in my previous operations management and administration-type role at a local major real estate development. The inception of Dactyl came suddenly, earlier this year, as the three co-founders coalesced around a single idea and realized we had the complementary skills to build a team that could pull it off. My brother, Connor, had been working as a freelance app developer in Vancouver for several years, and Justin had been interested in designing apps for several years as well. At one point in the spring my brother asked me if I had an idea for an app. 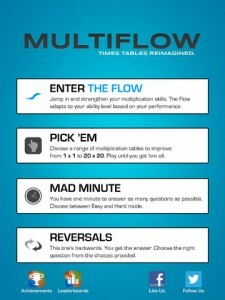 I pitched him an app concept called ‘Curt’s Multiplication’ which evolved into MultiFlow. We built the first prototype during a weeklong vacation in Phoenix. We showed it to Justin when we got back. He liked the idea but was adamant it wouldn’t sell unless it looked better visually. We started working with Justin on improving the visual design and the company came together organically over the summer through that partnership. It became clear to me, as I started working more and more evenings and weekends, that I wouldn’t be able to launch and market this app and future apps successfully while still working full-time. Q2: What attracted you to locate your office at VITP? Why the Innov8 Hub? I attended Camosun for several years and had done a co-op term with a company here years ago, so I was aware of the physical location and mandate of VITP. We were getting a bit cramped in the basement and wanted to find space that would inspire us and provide us with physical and spiritual room to grow and achieve. We were not aware of the Innov8 Hub when we inquired with VITP about space, but on our first visit to the Tech Park to look at our options, Dale Gann took us on a tour of the building and explained his vision for the Hub as a collaborative, open and engaging space for companies just like us. We are certainly pioneers in the building, but I think the intangible benefits of being in the Innov8 Hub will continue to grow as we are joined by more companies and the community grows. Q3. Where did you get the idea for MultiFlow? Were you a math whiz as a kid? I was good at math as a child and through high school, but I did not encounter much math at all throughout my post-secondary studies; I only encountered it indirectly via statistics, economics, and some watered-down ‘math for business students’ courses. However, in late 2011 I became interested in perhaps pursuing an MBA at some point (as many young professionals do after a few years in the workforce). One critical component en route to an MBA admission is the GMAT test, a challenging computer-adaptive test, which comprises both verbal and quantitative sections. My long journey towards a successful GMAT score is probably a topic for another discussion, but suffice to say that out of that experience I got the idea for MultiFlow. The GMAT test is taken entirely on a computer, and the defining characteristic of the test is that the questions are not predetermined, rather, they scale in difficulty based on your performance in real-time. If you keep getting questions correct, the questions will get harder, and vice-versa. Although this test format is extremely exacting and intense, I felt it was extremely effective at pushing people to think and reason at the peak of their cognitive ability. I wondered why this concept could not be applied to something much similar and scaled down to a simpler concept like basic times tables. From this thought experiment, the idea that would become MultiFlow was born. Q4. Most educational apps feature bright coloured designs and cartoon characters. Why is there no “Coco the counting Chimpanzee”? There was a conscious decision in the creation of MultiFlow to eschew some of the archetypical aspects of children’s apps. Hence, why we don’t have any cartoon characters or overtly colorful designs aesthetics. What we do have is a clean, sleek, almost neo-futurist design that is intended to push the user into a deeply-focused mental state as they concentrate on rapidly increasing their fluency with multiplication tables. We believe, and our reviews have verified as such, that the level of learning is elevated to the same degree with or without ‘Coco helping you count coconuts’ or some similar trope – as there is more focus and less distraction. Lastly, with the omission of cartoon themes we are able to appeal to adults as well. Q5. Why do you think MultiFlow has been so successful, having only been released six weeks ago? We were lucky to get a few breaks early on, including a tweet promoting MultiFlow by an official Apple Twitter account. We were featured in the New and Noteworthy section of the App Store and had our app reviewed positively by several online publications. However, these ‘lucky breaks’ are not just random acts of serendipity. We focused very hard and created a high-quality product across many domains: the visuals, the proprietary algorithm, the music, the icon, and the UI were all created with strict attention to detail and an adherence to our unified vision, which was to create the most effective product in the world for drilling multiplication tables. Q6. Are your next apps in development already? Yes. Building on the success of MultiFlow, we have created two more products in the same series. FlowPlus will tackle addition and subtraction, and DivisionFlow will tackle division in the same way that MultiFlow handles times tables. FlowPlus was released last week and DivisionFlow will definitely be released by the mid- to late-October. We also have some really exciting apps we intend to release in time for the Christmas season, which I unfortunately can’t talk about today. We’re all under strict radio-silence on those ones for now. Q7. Where do you see Dactyl being a year from now? I think we will have expanded. There is certainly room at the Innov8 Hub for us to grow organically. Although I don’t code myself, I’ve been primarily with my head down in the trenches, working primarily on product development, marketing and customer support, and generally trying to get this thing off the ground. Now that we have started generating monthly profits from sales of MultiFlow, and are stably ensconced at the Innov8 Hub, I may try and change hats a bit more and focus on hitting the streets to raise some more capital and build the overall awareness of our brand and vision for growth. There’s always a balance between zooming in on the micro-level details of the business and then getting out and building relationships, networking and solidifying and communicating the macro-level strategic vision. In the near-term, we’re looking at the idea of hiring a co-op student to help us build more products faster and expand into the Android market (currently our apps are available solely on iOS). In one year, Dactyl will have a world-renowned portfolio of products being used on phones and tablets and in classrooms all around the world. It’s clear that Dactyl has hit the ground running and it seems they have found their own niche in the apps space. Whether you’re a teacher looking to introduce new technology in the classroom, a parent trying to show children that learning is fun or an adult who digs brain teasers, MultiFlow is worthwhile buying. Want to read what others are saying about MultiFlow? Read below. Check out MultiFlow at the App Store here.